There could be many reasons why I might find myself in CC Bloom’s toilets on a Thursday afternoon, sponging foundation on my face under the watchful eye of Civil Disobedience’s Barry Church-Woods. But this time, the reason is their new show Jock Tamson’s Bairns, which is touring to venues around Scotland as part of LGBT History Month. Confused? Well, CC Bloom’s has provided rehearsal space for the show, which is an immersive new piece of performance exploring issues of equality and belonging. 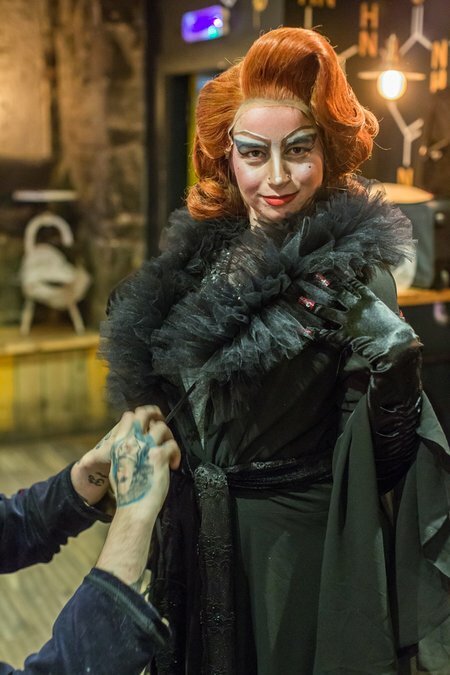 Written by Church-Woods, it was initially designed to be a live-action self-help manual for young people; it’s now “part drag, part cabaret, part theatre” and features The Duchess (Ewan James Armstrong), a drag queen and insult comic. Today, The Duchess is going to “drag me up” into a bio queen (a female who adopts the style of a drag queen) while I interview her and the company. Yes, this was all my idea. “Our working title was Unfuck Yourself, and then Chicken Soup for Your Hole,” explains Church-Woods, as The Duchess slathers more foundation on my face. “You need more foundation than skin,” she explains. “Funnily enough, programmers don’t really go for Chicken Soup for Your Hole,” interjects Louise Oliver, who also stars in the show. She was already being made up to be a bio queen when I arrived, and her makeup is perfect. Witty titles aside, the show, which is set in a drag club, explores the bystander effect and growing up gay in central Scotland. After waiting in the background for two-and-a-half years while Church-Woods and the rest of the team worked on other projects with their clients, including Courtney Act and Faith No More’s Roddy Bottum, the show is finally ready to hit the stage. They are also working on bringing the show to schools so LGBTQ+ young people can see it. As The Duchess carefully transforms me from plain old theatre editor into a bio queen called Fanny B’Gaslight, Church-Woods tells me more about the piece. It’s immersive, theatrical and boasts an excellent soundtrack, including artists like Annie Lennox, Madonna and Bette Midler. But at the heart of the show is Bronski Beat’s Smalltown Boy. To Church-Woods, the song describes a story that a lot of queer people have experienced; growing up gay in a regressive and unwelcoming environment and feeling the only option is to leave. “[It’s] the universal story that most queer, out of the mainstream people have. So, it started off like that, but the more research we did, we started looking at bystander behaviour, and so we landed on the Kitty Genovese case in New York.” The 1964 murder of Genovese, who was attacked outside her apartment complex by a stranger, was made famous by a New York Times article that alleged 38 people had witnessed the attack but none of them had intervened. Although this was later found to be inaccurate, it led to the creation of the term 'bystander effect': a phenomenon which stipulates that the more bystanders there are, the less likely someone is to help a victim. In the show, the audience will be invited to take part in open space discussions, but also to listen, and the hope is that they leave with better tools to help them to resist bystander behaviours. Meanwhile, my conversation with The Duchess inevitably moves on to RuPaul’s Drag Race. Her favourite Drag Queen from the show is Bianca Del Rio, while mine will always be Katya. Like Del Rio, The Duchess is also an insult comic. “I love a bit of an insult. I’m not saying I disagree with modern society, but with drag, it’s a rebellious thing,” she explains, reaching into one of her many makeup bags. 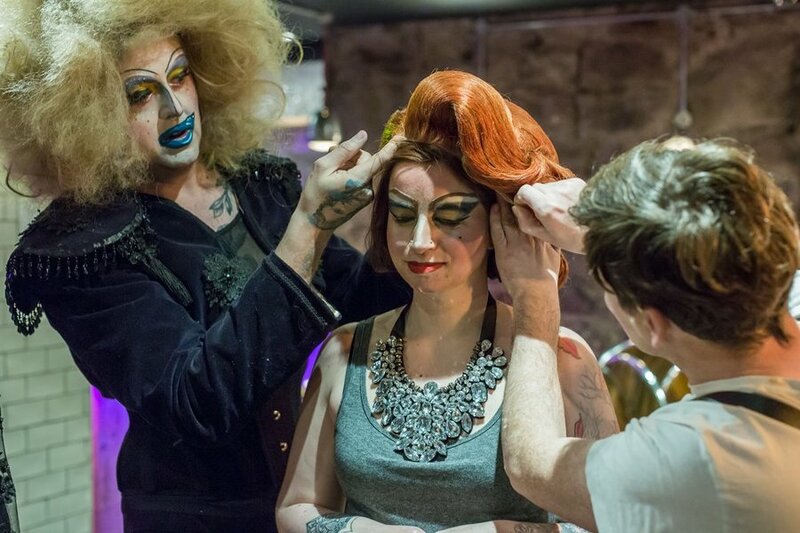 As she turns me into the bio queen I’ve always been, I wonder whether the enduring appeal of RuPaul’s Drag Race, and drag in general, is this sense of rebellion? In a society that enforces a strict gender binary, a man dressing as a woman is not only two fingers to the establishment, but also an escape. If you’d grown up presenting as anything that could be construed as “other”, and felt you had to repress who you truly are, then being given the chance to be who you want to be must feel like freedom. “Isn’t that also the point of drag in a way?" asks The Duchess, with one hand on my head while she gives me a new pair of eyebrows. "To get lost? It’s a world where you can get lost and you can be what maybe people don’t allow you to be, and that’s great that everyone’s doing it now." She continues: “That’s the positive thing in my opinion, about the bio queens, purely because they’re allowing themselves to have a bit more freedom over what they’re usually encouraged to do." It’s a cliché to say that I don’t recognise myself, because I do, but I’ve never worn this much makeup in my life. I am now dark eyeshadow and red lips and dramatic arched eyebrows. As The Duchess and Civil Disobedience stalwart Martin MacLennan helps me put on a wig that looks like it should belong to Wilma Flintstone, and the kind of flowing, impractical gown that a rich divorcee would wear to lounge around her mansion, complete with black elbow length gloves with red fake nails, I ask the key question – what on earth do I look like? Oliver says I look like “Lucille Ball, crossed with Mars Attacks!”, and she’s right, although I see some similarities with Elsa Mars from American Horror Story: Freak Show, myself. I’m led to a piece of staging and told to pose for the photographer, Chris Scott. My body groans from years of folding myself behind a desk and continually rearranging my limbs into unforgiving theatre seats. But I’m starting to feel different in going from bystander to centre of attention, occupying the space alongside The Duchess, Oliver and MacLennan. The colours in the room start to seem a bit brighter, I feel lighter, and by the end of the shoot, I’m even starting to enjoy it a little bit. But all too soon, it’s over, and I’m back in CC Blooms’ toilets, in my jeans and t-shirt, removing the last of the makeup. But I can’t shake the feeling that the clothes, the makeup, the wig, all made me feel and act differently. Oliver tells me that I started walking a little taller, too. How nice it was, to stop being a bystander, and just be someone else, for once.